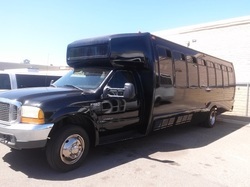 The Krystal Koach Party Bus is the top party bus rental in Lakeland, FL! Our epic party bust seats 28 to 32 party animals, and is perfect for any event that requires some serious partying and fun. So whether it is a sporting event, bachelor or bachelorette party, or a huge night on the town, the Krystal Koach will be a trip that you will remember for a lifetime.